The Monte Cimone, 2,165 m (7,103 ft) high, in the province of Modena, comuni of Fiumalbo, Sestola, Fanano and Riolunato. It is the highest point in the Emilia-Romagna region of Italy. It can be seen from very far away. It has the form of a low pyramid with a flat summit on its top. The pyramid has three sides with the three ridges pointing towards the west, northeast and south. There is road on the northeastern ridge that gets to the summit. The Parco regionale dell'Alto Appennino Modenese, also known as Parco regionale del Frignano, is near Monte Cimone. On the top of Monte Cimone, Roman objects have been found, indicating that the mountain has been climbed very early on. The first touristic climb has been recorded in 1567, when Guidinello Montecuccoli, a local nobleman got to the top. Later, the Jesuits made several trips to study the atmospheric conditions at an elevation of more than 2,000 m (6,562 ft). In 1908 a chapel was built dedicated to Madonna delle nevi ("Our Lady of the Snow"). On the very summit, there is a statue of the Madonna facing south. It is a frequented winter ski resort. In the peak there are 31 ski trails for a total length of more than 50 km (31.1 mi) (the longest trail is 3.6 km (2.2 mi)) served by 26 ski lifts. Ski season starts usually at the beginning of December (often in the last weekend of November) and ends in the middle of April. ↑ 1.0 1.1 "Monte Cimone, Italy". Peakbagger.com. Retrieved 29 August 2016. ↑ 2.0 2.1 Paolo Bonasoni, Paolo Cristofanelli and Angela Marinoni. Monte Cimone (PDF). 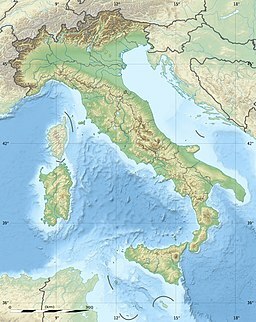 Consiglio Nazionale delle Ricerche and Parco del Frignano. Retrieved 29 August 2016. ↑ 3.0 3.1 3.2 "Monte Cimone: Overview". Summipost.org. Retrieved 29 August 2016. Wikimedia Commons has media related to Monte Cimone.